Start How Is the Internet Changing the Way We Work? Imagine you are a shopkeeper, living somewhere in Spain, in 1795. You no longer believe, as did the ancient Egyptians, that your king, Carlos IV, is literally a god, living on earth. But you still believe that he has a divine right to rule over you. You can’t imagine any country being governed well without a king who is responsible for the protection and control of his subjects. You have heard of the strange rebellion in North America where the British colonists claimed that they could govern themselves without any king at all. You’ve also heard about the recent violent bloodshed in France where a group of so-called revolutionaries killed their king, replaced the government, and destroyed, almost overnight, so many good things. But these experiments seem to you like profound mistakes, bound to fail. It just doesn’t make sense to say—as these democratic revolutionaries do—that people could ever really govern themselves. That’s a contradiction in terms, like saying that children could raise themselves or farm animals could run a farm. People can try it, you think, but it certainly couldn’t work as well as a wise and just king. Well, of course, today we know what happened to those strange democratic experiments. They worked. Really well. Over the past two hundred years those democratic ideas have triumphed in Europe, America, and many other parts of the world. While democratic governments are not everywhere in the world today, their economic, political, and military successes have far surpassed what almost anyone would have predicted in the late 1700s. And, perhaps more importantly, our whole way of thinking about many things—the role of government, the rights of people, the importance of public opinion—has profoundly changed, even in countries that don’t themselves have democratic governments. Now, we are in the early stages of another revolution—a revolution in business—that may ultimately be as profound as the democratic revolution in government. Like the democratic revolution, the revolution in business will lead to a transformation in our thinking about control: Where does power come from? Who should be in control? Who is responsible? In this new world of business, lots of highly connected individuals will each make their own decisions using information from many other places. In fact, this revolution is now possible because new information technologies make it feasible—on a scale never before possible in human history—for vastly more people to have the information they need to make well-informed choices. But the real impetus for this revolution will not come from these new technologies. It will come from our own human desires—our desires for economic efficiency and flexibility, certainly, but also our desires for non-economic values like personal satisfaction and fulfillment. In other words, one of the most important drivers of the revolution is this: for the first time in history, new technologies allow us to have the economic benefits of large organizations—like economies of scale and knowledge—without giving up the human benefits of small ones—like freedom, creativity, motivation, and flexibility. This revolution has already begun. We saw its harbingers in the final decades of the twentieth century in talk about empowering workers, outsourcing almost everything, creating networked or virtual corporations. We saw it in the premature—but partly correct—enthusiasm for new ways of doing business in the dot.combubble and in the slogan that “the Internet changes everything.” We see it all around us today in the increasing amount of choice many people have in how they do their work. But, like the loyal subjects of King Carlos IV in 1795, most of us don’t yet begin to understand how far-reaching these changes may eventually be. We still assume, without even really thinking about it, that someone always needs to be responsible and accountable in business. We assume that the managers of well-run companies should always be in control of what’s happening. We assume that power should always come from the top of an organization and be delegated down. There’s a technical term for the kind of organization this revolution will make more common. The word is decentralized. But most people have a very limited view of what this word means. If you’re like many people in business today, when you hear the word decentralized, you assume that it means delegating more power to lower-level managers inside traditional organizations. It might mean, for instance, letting divisional vice-presidents make product strategy decisions that used to be made by the CEO. But this limited kind of decentralization barely scratches the surface of what’s possible. Let’s define decentralization as the participation of people in making the decisions that matter to them. In this sense, decentralization means roughly the same thing as freedom. Decentralized organizations are those where more people have more freedom. And from this point of view, as you can see in figure 1, there’s a much wider range of possibilities for decentralization. The decentralization continuum. 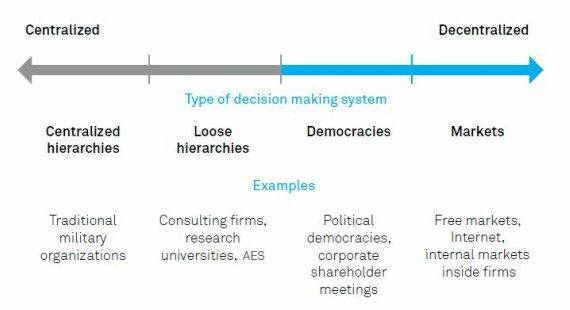 Organizations can be placed on a continuum based how much people participate in making decisions that matter to them. For example, some companies today already have loose hierarchies where they delegate huge amounts of decision-making authority to very low levels in their organization. Many management consulting firms, for instance, let the individual partners and consultants on a project make almost all operational decisions about the project. And AES Corp., one of the world’s largest electric power producers, has let very low-level workers make critical multimillion-dollar decisions about things like acquiring new subsidiaries. In an even more extreme example, one of the most important computer operating systems in the world today—Linux—was written by a loosely coordinated hierarchy of thousands of volunteer computer programmers all over the world. When most people think about decentralization, they stop at this point—delegating lots of decisions to lower levels in hierarchies. But what if power didn’t getdelegated to lower levels? What if, instead, it originated there? How much energy and creativity might it be possible to unlock if everyone in an organization felt they were in control? The most extreme kind of business freedom occurs in markets because, in markets, no one is bound by a decision to which he or she doesn’t agree. In a pure market, for instance, no one on top delegates decisions about what to buy and sell to the different players in the market. Instead, all the individual buyers and sellers make their own mutual agreements, subject only to their own financial constraints, their abilities, and the overall rules of the market. For instance, companies can use this form of organization by outsourcing things they used to do inside. Many companies today are already outsourcing all kinds of things, from manufacturing, to sales, to human resource management. In some cases, large companies may not even need to exist in the first place. Flexible webs of small companies or even temporary combinations of electronically connected freelancers (“e-lancers”) can sometimes do the same things more effectively. This way of organizing is already common in the film industry, for example, where a producer, a director, actors, cinematographers, and others come together for the purpose of making one movie and then disband and rearrange in different combinations to make others. Of course, there are many factors that affect how and where decisions are made in a business, or for that matter, in any organization. Here are just a few of the factors that sometimes matter: Who already has the information needed to make good decisions? Who already has the power to make the decisions, and whom do they trust to make decisions on their behalf? What specific individuals are potential decision makers, and what are their capabilities and motivations? What are the cultural assumptions in the company and its country about what kinds of people should make decisions? All these factors vary widely from situation to situation, but in general, they aren’t changing dramatically in any single direction overall. It’s the cost of communication. Then, only a few hundred years ago, our ancestors invented a new communication technology, the printing press, which reduced even further the costs of communicating to large numbers of people. This time, the declining costs of communication allowed our ancestors to reverse their millennia-long march toward greater centralization. Instead, soon after the printing press came into wide use, the democratic revolution began. Then, ordinary people—who could now be much better informed about political matters—came to have more say in their own government than they had usually had in all the millennia since our hunting and gathering days. Was the declining cost of communication the only factor that caused all these societal changes? Of course not. Each of these changes arose from complex combinations of forces involving many other factors as well. For instance, our human desires for individual freedom—and for the motivation and flexibility that often accompany individual freedom—were critical. But the declining costs of communication allowed by new information technologies like writing and printing played a key role in enabling each of these changes. And it is certainly interesting, to say the least, that the very same underlying factor is implicated in such diverse and important changes in human societies as the rise of kingdoms and the rise of democracies. Even more remarkable still is the fact that this very same pattern appears to be repeating itself now—at a much faster rate—in the history of business organizations as well! As a result of this massive—and successful—move toward centralization of business in the twentieth century, many of us still unconsciously associate success in business with bigness and centralization. But in order to achieve these economic benefits of bigness, many of the individual workers in these large companies had to give up some of the freedom and flexibility they had in the farms and small businesses of the previous era. It’s obvious that new information technologies can still be used to continue this trend—to keep creating ever-larger and more centralized business kingdoms. And some of the important business changes in the years to come will still be continuations of this previous trend—integrating larger and larger groups of people to take advantage of economies of scale or knowledge. With new technologies like e-mail, instant messaging, and the Internet, it’s now becoming economically feasible—for the first time in human history—to give huge numbers of people the information they need to make more choices for themselves. Decentralized businesses can usually be more flexible, too—both with their customers and with their own workers. Because they give people more choices, decentralized businesses just plain have a lot more chances to give people the things they really want. In other words, they give people more freedom. But these new decentralized businesses don’t have the limitations that small, isolated businesses did in the past. Because these new organizations have access to the best information available anywhere in the world, they can also benefit from many of the advantages of large organizations, too. If there are economies of scale in parts of their business, for instance, they can find the best suppliers in the world for those things. They can find customers all over the world, and they can use electronic reputation systems to establish credibility with potential customers who’ve never heard of them. And if someone on the other side of the globe has figured out how to do something better, they can learn from that experience, too. Of course, this kind of decentralization doesn’t work well in all situations. In some places, for instance, like making certain kinds of semiconductors, the critical factors in business success are just economies of scale. And, in these places, we should expect cheaper communication to lead to more centralization in order to take advantage of these economies of scale. So even though it won’t happen everywhere, we should expect this change to more decentralized decision-making to happen in more and more parts of our economy over the coming decades. Even where decentralization is desirable, however, the changes won’t all happen overnight. Just as the democratic transformation of societies evolved in fits and starts over a period of centuries, these changes in business will take decades to play out fully. And every time there is a setback in one place, or a failure to move forward somewhere else, there will be people who say that things aren’t going to change after all. When people over-invested in e-business and the speculative new economy bubble burst, for instance, many people thought that the old economy had won, and we were going back to business as usual. If decentralization becomes desirable in more and more places in business, then we’ll need to manage in new ways. But no matter how much we talk about new kinds of management, most of us still have—deep in our minds—models of management based on the classic centralized philosophy of command and control. To be successful in the world we’re entering, you’ll need a new—broader—set of mental models. While these new models shouldn’t exclude the possibility of commanding and controlling, they need to also encompass a much wider range of possibilities—both centralized and decentralized. Here’s one way of summarizing this new perspective: we need to move from thinking about command and control to coordinate and cultivate. For example, when you coordinate, you organize work so that good things happen, whether you are in control or not. Some kinds of coordination are centralized; others are decentralized. But either way, coordinating focuses on the activities that need to be done and the relationships among them. And that is a key part of how the world of management is changing: to be an effective manager in the world we’re entering, you can’t be stuck in a centralized mindset. You need to be able to move flexibly back and forth on the decentralization continuum as the situation demands. Since most of us already understand centralization pretty well, the thing that’s new—the thing we need to understand better—is decentralization. If you choose to, you can use the new possibilities enabled by information technology to help create a world that is both more economically efficient and more flexible than has ever before been possible in human history. There are many powerful economic forces that will lead us to do just that, to combine the economic benefits of bigness—like global scale and diverse knowledge—with the human benefits of smallness—like flexibility, creativity, and motivation. But that isn’t the end of the possibilities these new technologies provide. Because more people will have more choices, they can bring more of their own values into business. And that means you can put a broader range of your human values, not just your economic ones, at the center of your thinking about business. In other words, you can—if you choose—use your work to help create a world that is not just richer, but also a world that is better. Malone, Thomas W.. "How Is the Internet Changing the Way We Work?" In Ch@nge: 19 Key Essays on How the Internet Is Changing Our Lives. Madrid: BBVA, 2013.